I’m continuing my folktale picture book series with Native American stories — specifically, North America (excluding Mexico). Not too worry, South (and Central) America will get their chance, too! I was pleasantly surprised at the number of Native American folktales I found, not that there couldn’t be more, but because when I started this project I was hard pressed to name even one book (a sad commentary in and of itself). There are a number of folklore anthologies, but I limited this list to single title picture books. November is Native American Heritage Month, the perfect time to share these folktales with your kids but don’t let that stop you from enjoying these books all year round! As I mentioned in my introduction to African Folktales, these books are not substitutes for contemporary stories with diverse heroes and heroines (in any case, many of the books star animals rather than people, anyway). In addition, it’s important to remind kids that Native Americans are a diverse group of people. One population is not interchangeable with another, even though many groups may have similar qualities to their stories. Where possible, I’ve indicated the origin of the story in parenthesis (I took them from the notes in the books). As you might expect, most of these tales center around the importance of animals and connection between humans and the natural world. Many of them are also porquoi tales, a type of “why things are the way they are” story. Porquoi tales are common across all cultures and I find Native American versions particularly appealing. The Girl Who Loved Wild Horses. Paul Goble (who is actually from England!) wrote and illustrated numerous picture books and story collections based on Native American folktales and legends from several different cultures. The Girl Who Loved Wild Horses about a girl with a special connection to horses may be considered his most well-known since it won the Caldecott; other great choices include Her Seven Brothers and The Gift of the Sacred Dog. Raven: A Trickster Tale from the Pacific Northwest. Don’t be surprised if you see a trickster tale by McDermott on each one of my multicultural folktales lists! I loved Raven, about a raven-child who steals the sun and puts it back in the sky. New Kid (age 4) loved Coyote: A Trickster Tale from the American Southwest about how the mischievous coyote lost his beautiful blue color. Arrow to the Sun: A Pueblo Indian Tale. This is an interesting non-trickster tale by McDermott. The sun’s son, born of a Pueblo woman, is ridiculed as a boy for his fatherless state. He sets out to find his father, but must undergo a series of challenges first. When he reaches the sun, he is filled with its power and returns the spirit to the earth. McDermott’s beautiful illustrations earned him the Caldecott. How the Stars Fell into the Sky. (Navajo) Hoping to help people live peacefully and fairly, the First Woman wants to write the laws in the stars. The First Man dismisses her idea but determined to fulfill her duty, she courageously and patiently sets out creating a pattern that all will be able to see. Coyote begins to help her but when he sees how long and intricate the task is, he becomes frustrated and tosses his stars willy-nilly, obscuring the message the First Woman hoped to relay. The Navajo believe there is a message written in the sky, but this tale explains why no one has yet been able to discover it. How Chipmunk Got His Stripes. (Eastern) This is a fun porquoi story. Bragging Bear and Teasing Squirrel have a competition. Bear insists he can tell the sun not to rise in the morning, and squirrel insists he cannot. When the sun rises and bear looks foolish in front of the other animals, he takes out his humiliation on squirrel, transforming him into a chimpunk with the flick of his sharp claws. The moral: neither the braggart nor the teaser will win in the end. Rabbit’s Snow Dance. (Iroquois) I included this marvelous story on our favorite picture books of 2011. New Kid loved it and was singing Rabbit’s chant for quite some time. Rabbit performs his snow-dance so many times that the snow falls till it covers the trees. Unfortunately for Rabbit, this leads to a slight mishap which now explains why his tail is no longer lusciously long. You will be able to find even more Native American folktales by Bruchac, such as the above, and The First Strawberries (Cherokee), which explains how strawberries came to be. Big Turtle. (Huron) I seem to be saying this for a lot of these books, but this is another title New Kid has been requesting over and over again. Big Turtle is a creation story. When Sky Girl, pregnant with twins, falls from the sky she stays afloat on a pair of swans. The animals around her rally to create a more solid living surface and with the sacrifice of toad and the hard work of the others, create the earth on the back of the turtle. This story was one of my favorites. The Legend of the Indian Paintbrush (Plains Indians) and The Legend of the Bluebonnet (Comanche). These are two well-known tales written and illustrated by Tomie dePaola. Both porquoi tales feature children set apart from their peers but who bring their own unique gifts to the community as a result of their courage and determination. The Polar Bear Son. (Inuit) An old woman without any family adopts a baby polar bear as her son. When the cub grows up, the men of the community become jealous of its superior hunting skills and threaten to kill it. But the old woman remains loyal to the animal and spirits it away to safety. When Turtles Grew Feathers: A Tale from the Choctaw Nation. (Choctaw) This tale will remind kids of Aesop’s fable, The Tortoise and the Hare. A turtle and a turkey have a bit of a collision and a mix up results in a rather amusing race with an arrogant rabbit. Baby Rattlesnake. (Chickasaw) This is an engaging story for preschoolers about a baby rattlesnake who finally gets his rattle. The trouble is, he needs to learn how to use it properly and not just to create a little mischief. Parents will hope their kids pick up on the lesson of learning self-control and responsibility! The Mud Pony. (Pawnee) In this boy-hero story which emphasizes the importance of the connection between humans and the earth, a lonely boy crafts a pony from mud. When he is separated from his tribe, the pony becomes real, requiring only the boy’s faithfulness in return for reuniting him with his family. Eventually the boy’s faith in the horse helps him transform into a powerful and respected leader of his tribe. Kokopelli: Drum in Belly. (Southwestern tribes) There are a few picture books about Kokopelli, the humpbacked flute-playing deity, but I was only able to read one for this list. Haley’s book tells the tale of Kokopelli leading the ant people up from the darkness under the earth to their true home as humans in the green world. Coyote Steals the Blanket. (Ute) Greedy Coyote wants a beautiful blanket for himself. He refuses to heed Hummingbird’s warning that the rocks it was covering will be angry. When the rocks chase after him he learns the importance of respecting what belongs to others. Coyote Places the Stars. (Wasco) There are lots of Native American stories about coyotes and this one combines the animal with another one of my favorite themes: the night sky. Coyote builds a ladder to the moon and shoots an arrow into the sky creating the animal constellations. The Sun’s Daughter. (Iroquois) It’s so fascinating how legends which develop on opposite sides of the world can have such dramatic similarities. One would almost think this myth was based on the Greek myth of Persephone (or vice versa). Maize (like Persephone) is a harvest goddess who is captured by Silver, the cold winter god, when she travels too far from her home. He releases, her, but only for half the year. But when you hear the birds begin to beg the trees to “Please weep! Please weep!” you know she will return. If you do a comparative folk lore study with your kids, include this book. This list is incomplete, of course. There are many more Native American folklore picture books out there to explore and enjoy with your kids. What books would you add? We love getting more suggestions. What a wonderful list. There aren’t really enough Native American books available for kids and yet, there is so much there to explore and write about, expecially when it comes to folktales. I agree, Alex. There could be so many more books. Folktales have such a universal appeal. I find my kids really enjoy them, which makes sense — after all a story that survives generations has got to be captivating! This is such a neat and unique list of books. They would make an interesting unit study. Hope you’re having a great summer! It’s going pretty well so far! But it’s hot here! This is a nice list! The Eye of the Needle (Teri Sloat), which is based on a Yupik tale, is one I have. I also have a book for beginning readers called The Thirsty Moose (David Orme). Debbie, I tried to get The Eye of the Needle, but our library didn’t have a copy. Glad to hear it’s a good one. I haven’t heard of The Thirsty Moose, but I like the idea that there is a folktale published as an easy reader – what a great idea. Awesome list! We read some of the stories you shared, but not all. Nothing else comes to mind at the moment. Great collection! The artwork just looks amazing. Any idea if any of these come from Canadian authors? Perhaps the Inuit one? There is probably many books about (and by) the Aboriginal people of Australia too! Thanks so much for this list. Renee: good question! I don’t believe any of them are by Canadian authors and other than Raven (I suppose Pacific Northwest can refer to the area now known as Vancouver/B.C as well as in the US) their may not be any Native American tribes from the now-Canada area on this list. That would be an excellent thing to look into! I mentioned in response to a comment on last week’s list that I did look for books about Aboriginal people but couldn’t find any. An Australian who reads this blog commented with a bunch of title suggestions. They are in the comments on the African folktale post. What a great list, with so many titles unfamiliar to me (not for long! 🙂 Thank you for this! What an awesome list. What is challenging about folk tales at the library is finding them since they are alpha by author last name. I like reading by country so your list is wonderful! This is a great list. I used several of these picture books when I taught fourth grade. The kids absolutely loved them and loved to write their own porquio tales. I’m also excited to see several new ones on your list that I can’t wait to check out. These look really wonderful! The covers of these books really jump out at me. What a wonderful list! Arrow to the Sun is one of our favorite books. Can’t wait to explore the rest! Fantastic list! I must admit I haven’t read any of these.. so looking forward to gather these for our summer reading! Thank you for all your lists! I’ve been scouring all your lists and creating To-Read lists in my library account. Now where to start? It makes me so pleased that you’ve found lots of new books to read. I hope your library bag doesn’t get too heavy! I love your list and need to add some of these titles to our library – one of our very favorite books is “The Rainbow Crow” by Nancy Van Laan – it’s a really lovely Lenape tale. These are so awesome! :) I can’t wait to check them out. Sharing with all of my networks as well! Thank you – I hope you enjoy reading them. Thanks, Jody. I’ll have to look for that one, too. Don’t miss this vetted list from First Nations authors/illustrators. 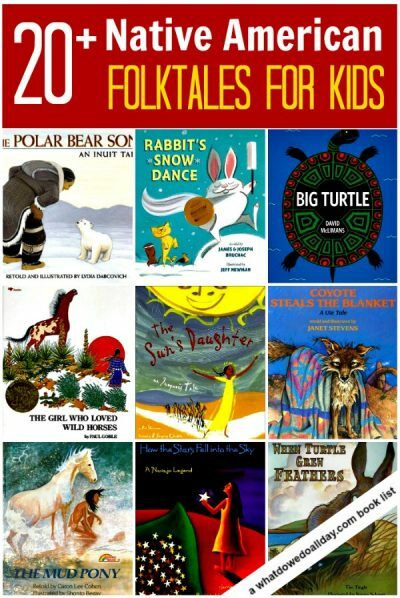 And this link to best children’s books by First Nations authors/illustrators. All Fantastic books to share anytime of year.